When Tricia Fabrizio bought her home in Providence, R.I., the previous homeowner had built a sunroom, but neglected to add heat. The result was a room with a lot of potential, but limited usability. Initially, Fabrizio settled for using space heaters, but this option turned out to be both expensive and ineffective. The room did not maintain heat, or what little heat remained was uneven throughout the room. After planning to turn the room into a dining room, Fabrizio started exploring options for an in-floor radiant heating system, which friends had recommended to her to improve the usability of the room. After researching radiant floor heating systems from WarmlyYours Radiant Heating and noting the ease of installation, Fabrizio felt confident enough to tackle the project herself. Fabrizio is one of a growing trend of women tackling home improvement projects themselves. According to a study out from Marketing to Women, home improvement stores Lowe's and Home Depot report that 50 percent of their customers are women, and those women are responsible for initiating 80 percent of home improvement projects. It’s an impressive number, although not all of them are installing an entire floor and in-floor heating such as Fabrizio! Products that are easy-to-install, reliable, and quality are important to Fabrizio. “I need to know it is going to last,” she says. She looks at reviews as an all-important part of making her decisions when picking products she will install herself. You’ll find reviews of WarmlyYours products throughout the website, and there are additional reviews on www.Houzz.com. Before beginning the project, Fabrizio took advantage of the SmartPlan™ service, a free service from WarmlyYours that allows installers to send in an actual floor plan or sketch of a room that includes dimensions to receive a custom installation plan prepared by our engineers specifically for your room design. “It was easy to follow the installation plan,” Fabrizio recalled. “While we had a few questions related to the start and ending point of the mats, when we called tech support they were very helpful,” she shared. Originally the floor was carpet, but Fabrizio wanted to install porcelain tile. She ripped off the carpet. No insulation was added because the subfloor was plywood. Fabrizio decided to go with a latex modified thin set mix to pour over the installed floor heating system, the TempZone™ Floor Heating Cable (Twin), and she stapled down the system “so it was easy to go over it without it moving around.” She also installed a SmartStat™ Programmable Thermostat™. 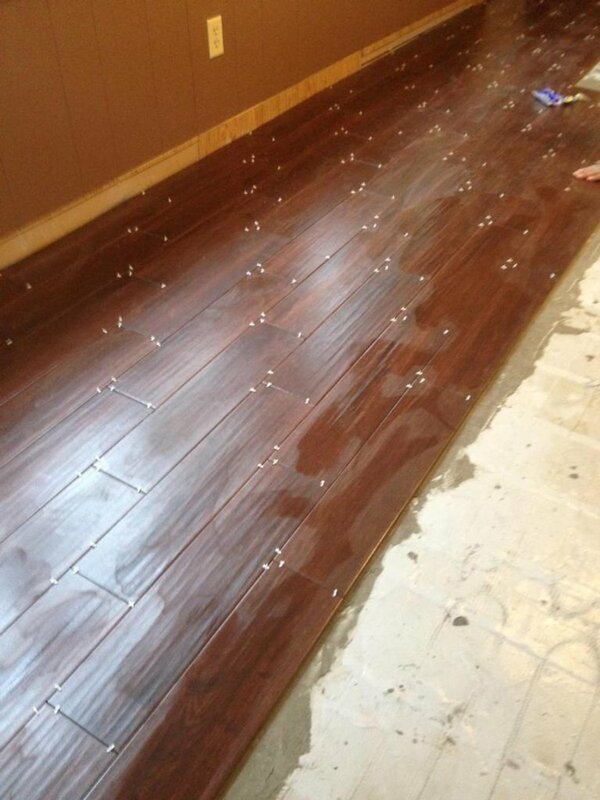 After letting everything dry over a few days, she set up the porcelain tile, completing the room. “We have a dog and a cat and they love to play in this room all the time, so I am sure they will be the first ones to enjoy these warm floors!” Fabrizio remarked. We applaud Fabrizio’s work and tenaciousness. Here at WarmlyYours we strive to create projects that make life easier—from the beginning stages of the installation and planning process to the products’ ease-of-use and functionality once installed. Have you tackled a DIY project with WarmlyYours products? We’d love to hear about it! Share your story, send us photos on the WarmlyYours Facebook page, or tweet us at @WarmlyYours.